While the National Catholic Youth Conference (NCYC) focuses on giving 20,000 teenagers the opportunity to deepen their relationship with God, it’s a focus that youth ministers—and many adults—strive for all the time. 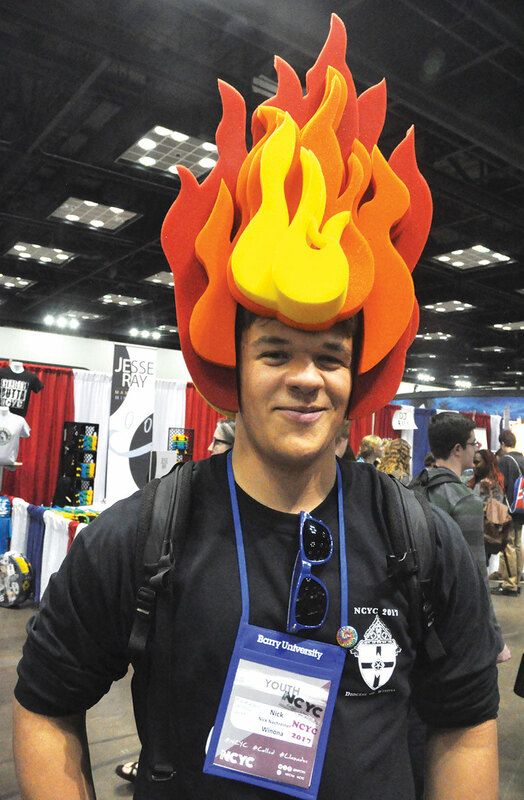 Knowing that commitment, The Criterion asked adult chaperones and youth ministers at the conference why they attended, and what they hoped the teenagers gained from their pilgrimage of faith to Indianapolis. Jeff Scott, a chaperone from St. Malachy Parish in Brownsburg, attending with his son and daughter. “It shows these guys there are other kids here celebrating their faith at the same time, and making it fun. … There’s incredible energy. Joi Hunter, St. Charles Lwanga Parish in Detroit, in the Archdiocese of Detroit. She is a youth minister, and she first attended NCYC in Indianapolis as a chaperone in 2001. Sarah Mefford, 7-12th-grade youth leader at her church, St. Pius X Parish in Moberly, Mo., in the Diocese of Jefferson City, Mo. She attended with her younger daughter. “Two years ago, my oldest daughter and I came, and we were so inspired and moved by the whole process, that it just ignited us that we had to come back. “It’s very powerful to see this many Catholics worshipping together. It really drives home the fact that we’re part of something bigger than ourselves. We come together, and we all believe the same thing, and there’s so much power in that. Daniel Gaskill, St. Francis Borgia Parish in Blair, Neb., in the Archdiocese of Omaha, Neb. He attended with his 15-year-old son. “It’s just incredible. It’s been very moving, very emotional. I might start crying right now. Just to see the youths and the way they’re absorbing these different events is something I’ve never witnessed at this magnitude in my entire life. Willie St. Pierre, youth minister in the Diocese of Houma-Thibodaux, La. Todd Levitas, a youth minister for the Archdiocese of Washington, at NCYC for the first time.